Relax before your flight in a lounge at Gatwick Airport. Escape the busy airport terminal and enjoy complimentary drinks and snacks whilst you catch up on work, read or simply sit back and soak up the chilled out atmosphere. Our Gatwick Airport Lounge options are listed below with guide prices for a an adult pass. Click on a lounge's name to find out more information. Book a Gatwick Airport Lounge with FHR and enjoy unlimited free Wi-fi, magazines and newspapers, with a tranquil space to await your flight, away from the busy departure lounge. The lounges offer a range of alcoholic and soft drinks and beverages together with simple snacks, however apart from the Club Rooms at Gatwick they don’t offer full meals. My Lounge, by No1 Lounges, a contemporary and informal lounge a games room and a TV den. Think American style coffee bar or loft living. At the bar you can pull your own pint or pour yourself a glass of wine. Selected spirits are also available as are soft drinks and juices. Hot & cold snacks, are laid out on their long kitchen counter where you just help yourself. 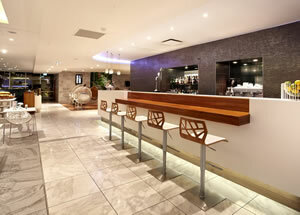 The larger Number 1 Lounge, is a stylish lounge with runway views, a quiet library area and range of seating choices. With a fully tended island bar serving alcoholic drinks, they have variety of hot and cold food items available for you to help yourself to, as well as hot beverages and cold soft drinks. North terminal also has the newly refurbished Club Aspire Lounge, with a dedicated Quiet Area as well as a Business Zone if you are catching up on your work. They also have table-side charging facilities for guests' portable electronic equipment, ensuring everything is fully charged for onward travel. For that premium VIP feel, why not try the Clubrooms. Welcomed by a dedicated host, enjoy delicious hot bistro dishes, award-winning champagne or premium spirits and first-rate wines, whilst catching up with the news or flicking through glossy magazines. The No.1 lounge at Gatwick South Terminal has unrivaled views of the runway and is a great place to watch the planes go in and out. There is a fully tended island bar surrounded by stools and hot and cold snacks available. There is also an opportunity to experience the Clubrooms in South Terminal too, even those on budget flights, can now be treated as a VIP. With fresh seasonal food and premium drinks served at your table. It's simple and easy to book any of these lounges at Gatwick. Enter your details in the search form above to see a list of available lounges and enter our secure online booking system. Make sure you know which terminal you are flying from though. Alternatively, if you would like to discuss your options and find out more then our operators are on hand to help and use their vast experience to assist you in selecting the best option.